Ilyashev & Partners Law Firm has affirmed its leading positions in litigation and bankruptcy practice areas as well as was included into the list of top-3 law firms in the spheres of tax litigation, international trade and shipping & maritime according to the results of 14th national independent research Ukrainian Law Firms 2016. A Handbook for Foreign Clients. The Firm has been also acknowledged as #1 in aviation for the first time. • Olena Omelchenko was recognized as Top-5 leading individuals in International Trade. Reputable litigators Ilyashev & Partners expanded the firm’s client base last year while continuing to protect the interests of its regular clients in various fields both in Ukraine and abroad. In March 2015 the firm opened in Moscow, Russian Federation. By the end of 2015 this office had acted on more than 100 disputes and arbitrations in Russia. The team has actively accompanied disputes on the territory of Crimea. Among recent notable cases in representing FGC More in a USD 240 mln international conflict in connection with the “nationalization” of the company’s assets in Crimea by the Russian Federation. The firm remains a port of choice for regular clients like BTA Bank and Nadra Bank, representing their interest in numerous disputes, including cross-border litigation and arbitration, debts restructuring projects, insolvency procedures and enforcement of collaterals. The sizeable team is led by Mikhail Ilyashev, managing partner, who comes highly recommended by the market and Roman Marchenko, senior partner. The strong team of Ilyashev & Partners Law Firm is known mostly for representing clients related to complex insolvency proceedings and bankruptcy litigation. The firm’s long standing clients, BTA Bank and Nadra Bank, make up a significant caseload of bankruptcy matters. The firm regularly acts on high value cases, among others, continued to act during insolvency procedure of Sumykhimprom for over USD 165 mln, where the sanation procedure is introduced. Other notable cases include supporting the bankruptcies of FSC More and Okean Shipyard. With the opening of its Moscow office in March 2015, the branch got instructions to support bankruptcies of Russian developers with claims valued at USD 319 ml. The well positioned team is led by renowned insolvency practitioner Roman Marchenko, senior partner. The name of Vadym Kizlenko, another notable team member, is known on the market. Ilyashev & Partners is a prominent litigation force on the Ukrainian market that opened office in Moscow in 2015. Amongst the recent notable highlights is support of the insolvency procedure of FSC More (Crimea) and anti-crisis management in two jurisdictions (Ukraine, Russian Federation) where the firm handles tax litigation, and advises on the tax consequences of restructuring and restoration of right to VAT credit and refund. The firm commands consistent following of its established clients: ArcelorMittal Kryvyi Rih in tax litigation representing the client in more than 20 disputes challenging the tax assessment notices, collection of VAT arrears for over USD 22 mln; and Antonov State Enterprise challenging USD 39 mln penalties. The lead partner of the tax team was Maksym Kopeychykov. The international trade practice of Ilyashev & Partners was launched in December 2014. The firm attracted Olena Omelchenko, who has considerable experience in this field (i.e. has been involved in conclusion of trade agreements) and earned strong feedback from peers. Throughout the past year the instructions of clients included representation in antidumping and safeguard investigations, market access and customs matters. For example, the firm represented AGC Glass Company in an antidumping investigation import float-glass originating in Russia; and acted for ArcelorMittal Kryvyi Rih on the imposition of import restrictions on iron fittings by Egypt. Mikhail Ilyashev is a lead partner. Ilyashev & Partners has a formidable reputation of diverse transport expertise on the market working on aviation and maritime mandates. The firm represents State aircraft construction enterprise Antonov in numerous litigation cases. Amongst the highlights is litigation on damage recovery caused by an incident involving birds at Genoa Airport in 1997. The firm handles the representation of a vessel owner, Black Sea Shipping and Ship Repair Ltd, on repair fee recovery and vessel arrest in the Supreme Court of Turkey. Renowned for his litigation track history, Roman Marchenko, senior partner, acts as an arbitrator between Petrochemical Logistics and Unichart Ltd in a case of breach of charter contract under LMAA rules. Ilyashev & Partners develops and broadens its offering on various mattes of antitrust law in Ukraine and abroad, inter alia, merger clearance work, anticompetitive practices, public procurement. Amongst notable highlights of the past 12 months is advising Letter One Group in the acquisition of the German company RWE Dea AG and assisting PZU S.A. in the acquisition of shares in Alior Bank. The firm is also present in some investigations conducted by the AMCU. Oleksandr Fefelov, the head of antirust and competition practice, is a point of reference named by peers. In 2015 Ilyashev & Partners gained solid sector clients, among others OLAM Ukraine, Danone, Agrein, RONLY, Noble Group, and continued supporting KWS Ukraine and Creative Group. The sizeable team is well-versed in comprehensive cross-border litigation and arbitration. The firm represents Agrein group in a high value USD 200 mln corporate dispute. Transaction support was performed with a number of corporate, M&A and asset acquisition assignments in the past year. Maksym Kopeychykov was the lead partner. Throughout 2015 Ilyashev & Partners demonstrated a broad spread of labor matters, including related M&A support, compliance, contractual issues, redundancies, and traditional for this firm resolution of individual and collective labor disputes. Some representative work included disputes against the Ministry of Industrial Policy and its candidate regarding dismissal and further confirmation of powers of the president of State Enterprise Antonov. Among key clients are: Delegation of the European Union to Ukraine, World Bank, ProCredit Bank, BTA Bank, ArcelorMittal Kryvyi Rih; Platform Specialty Products Corporation. The practice is headed by the firm’s managing partner Mikhail Ilyashev. Ilyashev & Partners covers its strong litigation performance, and is increasingly active in regulatory and restructuring matters. Banks formed a formidable part of the firm’s client base and counts BTA Bank (Kazakhstan, Ukraine), Bank Mykhailivskyi, Procredit Bank, Trasta Komercbanka, Credit Europe Bank, Crimean Development Company, PZU, Group DF. The firm continued to receive the bulk of its work from BTA Bank Ukraine, in particular, restructurings; Bank Mykhailivskyi hires the firm for regulatory advice. PZU Ukraine was represented in the adopted course of challenging decisions by the National Commission in Regulation of Financial Services. Partner Maksym Kopechykov headed the banking and finance practice. Ilyashev & Partners, the Ukrainian firm in 2015 opened offices in Moscow and Simferopol, is becoming more visible in corporate work. In the mainstay of the firm are cross-border mandates, corporate governance and contentious work. The portfolio of clients include such solid names as BTA Bank, State Enterprise Antonov, Algol Ukraine, ArcelorMittal Kryvyi Rih, Group DF, Kyivstar, Ukrplastic, Ukrrichflot, Etrex. Noteworthy, the firm actively supported exits from annexed Crimea, i.e. advised METRO Cash & Carrt Ukraine. Another notable project is corporate restructuring and reorganization of the companies of Danone Ukraine and support for a venture fund and asset management company in terms of purchasing a grain mill. BTA Bank regularly instructs the firm for high stake projects, i.e. sale of stake in several jurisdictions in course of appealing control over oil port in Murmank (Russian Federation) and other M&A mandates. Partners Mikhail Ilyashev and Roman Marchenko are in charge of the practice. The representative cross-border performance of Ilyashev & Partners includes legal support of international extradition of the former owner of BTA Bank, Mukhtar Ablyazov, to Ukraine and Russia from France, and currently acts for the Prosecutor General’s Office of Ukraine in two extradition processes in England. In Ukraine the firm is involved in representing an official agricultural holding in criminal proceedings regarding embezzlement through abuse of office. Artem Orel is the main criminal defense attorney. Partners Mikhail Ilyashev and Roman Marchenko are the main contacts. Natural Resources Ilyashev & Partners climbs to being a widely-referenced Firm for its wide scope dispute resolution work. Its list of clients includes UkrGaz, UkrGazEnergo, LetterOne Group, Black Iron Inc, Hydro Energy Holding, Group DF. In March 2015 the firm enhanced its network of offices by establishing a branch in Moscow. The landmark assignment of the firm is representation of UkrGazEnergo in two major disputes with National JSC Naftogaz of Ukraine. Another litigation of note is representation of RGK Trading (Group DF) in a USD 62 mln dispute with Odessa Port Plant on payment recovery for supplied gas. Mikhail Ilyashev, managing partner, heads the practice. Intellectual property Ilyashev & Partners is primarily known for contentious performance, in particular, trademark disputed. Pharma, cosmetics and manufacturing are part of the team’s industrial focus. The firm represented Feron in protecting IP rights to the trademark “Viferon”; OmniFarm regarding the protection of IP rights to the well-known in Ukraine trademark “White Coal”. Notably, the firm acted as legal advisor to Honda on IP rights protection in the process of launching the Honda App Centre in Ukraine. Irina Kirichenko, patent attorney, is known primarily for successfully advising pharmaceutical companies. International arbitration As a recognized dispute resolution force for domestic and multi-jurisdictional litigation, Ilyashev & Partners is rapidly developing its capacities in arbitration. One consistent client, namely BTA Bank, enlisted the firm for representation in a number of high-value arbitration proceedings of the ICAC at the UCCI regarding collection of assets of guarantors in Ukraine. Another highlight included a number of arbitration proceedings on non-payment of freight at the LMMA. Dmytro Shemelin was named by colleagues for his extensive track record. The practice is overseen by managing partner Mikhail Ilyashev, while senior partner Roman Marchenko was enlisted as an arbitrator in a range of LMAA cases. Ilyashev & Partners Law Firm demonstrates a strong following of telecom clients that are represented in court proceedings and before regulators. For example, the firm represents Kyivstar in an extensive list of disputes. Another significant client, TV Channel Inter, is represented in a number of litigations regarding sanctions and licensing. Mikhail Ilyashev and Maksym Kopeychykov are the lead partners. Andriy Konoplya, Dmytro Shemelin and Irina Kirichenko. IP rights protection matters are the mainstay of Ilyashev & Partners. Among the team’s recent highlights is representation of Feron in protection of its rights on “Viferon” trademark. Megainpharm GmbH, OmniPharm, Takeda, Pharmacy of Hormonal Drugs, Business Center Pharmacy cab be found in the firm’s client portfolio. Irina Kirichenko is especially noted for her IP experience in the pharmaceuticals sector. Mikhail Ilyashev, managing partner, supervises the practice. Another important figure is Galyna Melnik. Ilyashev & Partners has a robust practice with notable mandates in traditionally strong litigation and increasingly active transactional scope of advice. The firm advises Ukrrichflot on registration of titles to real estate objects throughout Ukraine It recently developed a contractual base for construction of residential and office premises in Kiev. With offices in Simferopol and Moscow, the firm’s workload is effected by the issue of Crimea. For example, the firm advises owners of shopping mall Meganom in Simferopol (Crimea) on the regulatory and tax effects of Russian annexation of Crimea, as well as on possible options for further operation and ownership of the shopping mall; and represented the Ukrainian subsidiary of METRO Cash & Carry on disposal and transfer of its real estate in Crimea in connection with annexation. A steady workflow of instructions is traditionally generated by the firm’s long-standing client Nadra Bank. As a top litigation practice, the firm rendered legal support in a court dispute over USD 400 mln worth of construction loans granted by the BTA Bank (Kazakhstan). Partners Maksym Kopeychykov, practice head, and managing partner Mikhail Ilyashev, are at the forefront of the firm. 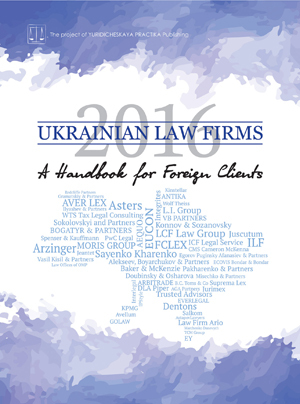 The research Ukrainian Law Firms 2016. A Handbook for Foreign Clients is published in the English language and represents major Ukrainian law firms in key areas of law. The Handbook is a single source designed to assist foreign companies in choosing their partners by giving an assessment of development and achievements of the internal legal market. The Handbook is a project of Yuridicheskaya Practika Publishing House.